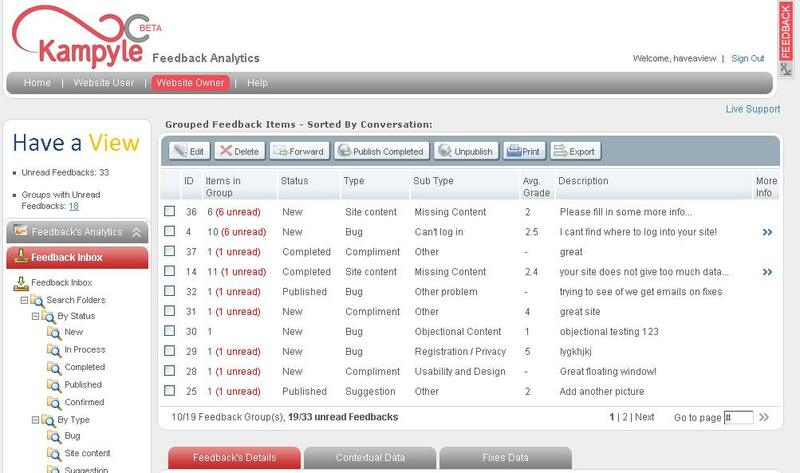 One of the key ingredients to success on the Web is rapid iteration, and to do so, eliciting user feedback is a must. As we know, TechCrunch is a breeding ground for avid beta testers keen to provide input and suggestions. Yet, more often than not, when we do offer feedback to a site all we receive in return is an auto-reply, thank-you email. When was the last time you submitted feedback to a site that was then followed up with an actual acknowledgment that the bug was fixed or the feature integrated? My guess, not very often. Kampyle—yet another Yossi Vardi startup from Israel—has developed a feedback management platform aimed at assisting site owners better manage this feedback loop and, along the way, increase customer loyalty and satisfaction. The underlying premise here being that users expect not only to be heard, but also responded to. This is especially true when providing feedback on services, products or customer experiences. Sites that manage their feedback right end up with deeper customer engagement, lower shopping cart abandonment, and better usability. 1. 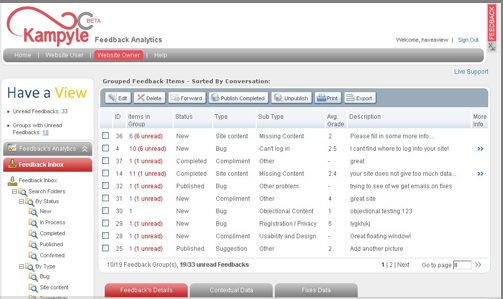 Collection: A feedback collection form (see screenshot on right) is launched through buttons scattered across a site. Kampyle will roll out advanced customization options throughout the coming weeks. 2. 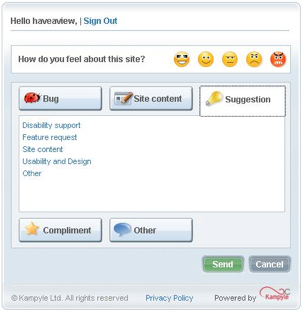 Analysis: Kampyle provides user feedback along with contextual data such as screen resolution, browser type, operating system, etc. Slicing and grouping functionality delivers a greater understanding of why an issue occurred, which ultimately translates into what to do about it. 3. Management: Data and suggested corrective actions are arranged in intuitive dashboards. Data is exportable to XML & Excel. Nothing much to write home about here. 4. Action: CRM-like functionality completes the feedback loop by allowing site owners to inform groups and individual users of the corrective action they have taken. The notification even includes a link to where the fix was made and offers a thumbs-up/down rating to further express satisfaction. All-in-all a wide variety of companies can benefit from a service such as Kampyle’s, which is bridging the gap between CRM and site-side analytics. Extending the CRM functionality to piggyback on full-blown CRM platforms such as SalesForce, SugarCRM, and even Zoho would go a long way in popularizing the service. Kamplye is still in closed beta so pricing is yet to be established, but once the service is commercially available 250 TechCrunch readers will get their first month free. Sign-up here to get on the list.